Large oceanfront home with breathtaking views and only steps to the beach is now available for bookings! Centrally located between Boston and Cape Cod, Scituate is a quintessential seaside town with a working harbor and access to beaches, swimming, boating, fishing and hiking. Boston is about one hour north and is accessible by car, ferry or train while historic Plymouth is only a 30-minute drive south and Cape Cod only a little further. This home features 3,000+ sq. ft. of living space, 5 bedrooms, 2.5 bathrooms, unobstructed views of the ocean and is steps from sandy Peggotty beach, all of which is located on a quiet, private way at the start of Third Cliff. The large front deck offers stunning ocean sunrises in the morning and full days of sunshine overlooking the water while the back deck allows for late afternoon sun, evening grilling and watches over the back yard which is suitable for games and activities. The home also offers a fully-equipped kitchen, a washer and dryer, an open floor plan with two large living areas, wireless internet, cable TVs, DVD player with DVDs, books, games, fireplace, wet bar, gas grill, outdoor furniture (including tables with umbrella and chairs, cushioned lounge chairs and Adirondack chairs), beach toys/chairs and a two-car garage with ample additional parking. Conveniently located just one mile from Scituate harbor allows quick access to cute shops & boutiques, pastry and coffee shops, great restaurants, ice cream shops, a movie theater, a grocery store, banks and a pharmacy. Superb location for swimming, boating, paddle boarding, surfing, walking, biking, golfing, fishing off the sea wall directly in front of the house and exploring everything the area has to offer. Please note, some furniture and decor may be different upon arrival and the home is not equipped with A/C, though fans are provided and the oceanfront location allows for breezes to easily circulate through the house. The home is stocked with a generous starter supply of paper and soap products but you may need to supplement this during your stay. I am the third generation in my family to own this home. My grandparents purchased this property, what used to be an oversized summer cottage, in 1959 to be able to spend summers by the sea with their growing family. In the mid-80s, wanting to relocate to Scituate permanently, they took down that home and built the home as it stands today. Their eight children then took ownership of the home and more recently, in 2015, I purchased the home from my father and his siblings. This house has been central to family gatherings and lazy weekends and holds a very special place in my heart. The location of the home is ideal - immediately on the ocean, steps to the beach, a mile to the harbor, among all of the activities in the area (swimming, boating, golfing, exploring the beach and marine life, walking, surfing, hiking, sledding, ice skating) - and offers enough space for even large families to be comfortable. in kitchen. also two stools at eat-in counter. Great base for vacationing family. Only good things to say. Unbeatable location. This house was perfect for our group of women ranging in age from 35 - 83. The two main floor bedrooms were perfect for the three elderly women; only a few stairs to climb for them. The deck was our favorite place; we spent most of our time out there when at the house. I got up one morning to watch the sun rise - gorgeous! 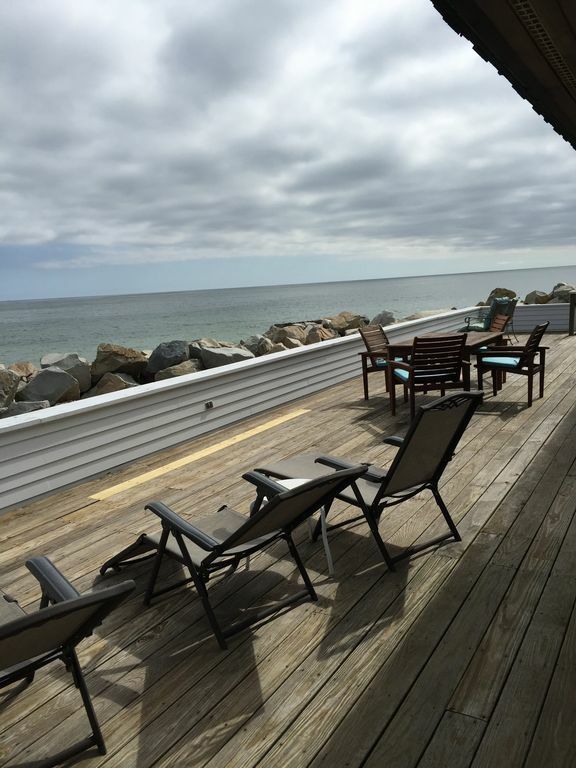 The house was conveniently located to a beach, restaurants, shopping and the train station. If I every come back to Massachusetts again, I would love to stay here again! House was well equipped. Ocean views were spectacular. Would definitely rent again! A wonderful house, beautiful view, and the hostess was very accomedating! My husband and I rented this home for ourselves and our wedding party including our small dog. Not many owners allowed dogs so we were so happy that this home did! The house itself was fully equipped, clean, and spacious. It had ample parking and a beautiful view of the ocean. Waking up to the breathtaking seaside view on my wedding day was just simply amazing. The home is also a few minutes from Front Street where all the restaurants and cute boutiques are located. It's also less than 10 mins away from Scituate Harbor, where the light house is. Overall, we really enjoyed our stay here. Meredith, who is the owner was also very responsive which we really appreciated given things were so hectic on our end leading up to the wedding day. She got back to our questions very quickly and was helpful. I would definitely recommend this home to anyone! Our group enjoyed looking out and see the ocean. We night we built a fire on the beach and ate s’mores. I would recommended this home. Swim and surf at the beach, bird watching, golfing (including award winning Widow's Walk Golf Course), ice skating on the pond, enjoy fine dining and shopping in Scituate Harbor or neighboring Cohasset & Marshfield. Fishing from charter boat or from beach and nearby kayak and paddle board rentals. Enjoy popular live music at South Shore Music Circus. One hour to Boston or Cape Cod, and 30 minutes to historic Plymouth.